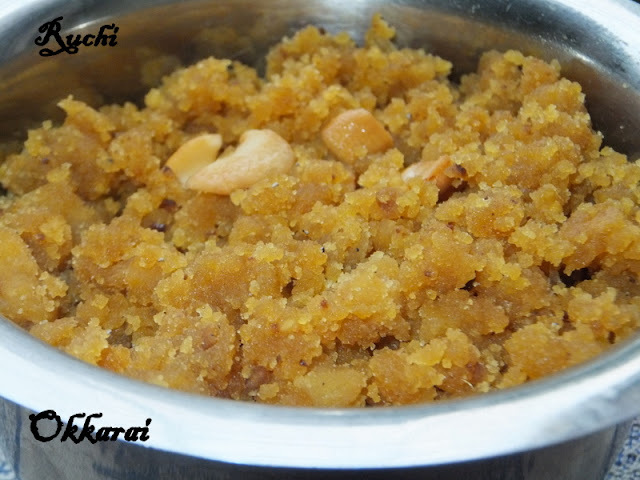 Okkarai is a famous traditional & one of the mandatory sweet dish is very popular among in Tirunelveli - Shenkottai /Trivandrum Brahmin families. This is so quick to make with minimum ingredients like Chana Dal (Kadilai Paruppu) and Jaggery and does not require much ghee. These sweets dish is my family’s favorite. Roast the chana dal well in a dry pan till it turns reddish brown. Soak it in water for 2 to 3 hours and then Drain the water and grind this into a smooth paste .While grinding just add 1 tbsp water. After steaming, break it into pieces and once it is cool, and then crumbles it nicely. In a pan put the jaggery and add water, Let the jaggery melt and comes to 1 string consistency add crumbled dal mixture to this and mix it nicely. Add a tblsp of ghee to this and mix well, and cook in medium flame till it leaves the sides of the pan and it becomes soft and reaches a puttu consistency. Then add cardamom powder,and mix well . Garnish it with ghee fried cashews. Now delicious okkarai is ready! Love this traditional and authentic okkarai.